Watch how Bunty Pundir creates this fantasy piece featuring a boy walking towards a glowing moon hovering just ahead of him. Using just a few stock images to create this scene, you’ll see how the background is stiched together and how the boy, the night sky and the moon are all incorporated into the finished piece. This piece is one of Bunty’s finest works and I think you are going to enjoy it! These images were created by Shift Art members, based on In My Dream by Bunty Pundir. Join Shift Art to show your version! Thank you Bunty! 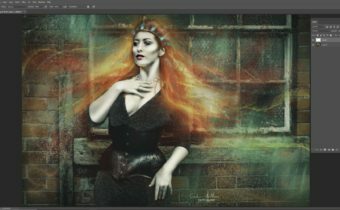 I found the image quite pretty so felt inspired to start here for my first tutorial. It seemed well layed out although there were a few steps that I felt should have been listed that I got a bit stressed out about to figure out. One easy example that I can mention is towards the end of the tutorial when he recommends adding some more stars to the sky, he suggested painting them in with a soft white brush but it just didn’t look quite right to me. Then I remembered that I loaded some star brushes that he included, went through those and found one that matched much better. Overall this was enjoyable though and happy with my final result. This is one of the most helpful tutorials I have ever encountered. Thank you Bunty!